Match the twirling gift boxes! This charming game will delight you for hours! 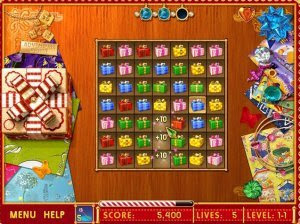 Choose from four different puzzle games! As you match the gifts you may earn magic wands or diamond bonuses. Advance to the next level and watch the gift boxes twirl! Dazzling graphics and joyful theme music make Adventure Match perfect for the entire family!